EEP (Business Analytics and Intelligence) from IIM, Bangalore. Satish brings 8+ years of experience in the field of Pharma & Healthcare domain and is an inventor of 4 US patents. Predictive churn models helped a leading Indian technology company reduce employee churn and understand the drivers of employee dissatisfaction. Better quantifying the effect of TV advertising campaign helped a leading Indian e-commerce firm optimise and get better ROI on TV Ad campaigns. Predicting the possibility of a customer contacting customer service helped a leading Indian e-commerce company reduce in-bounce customer contacts and improve customer relationships. A recommendation engine was build for a mobile app for a US based IOT start-up. Credit rating system was developed using machine learning algorithms for a European microfinance company. 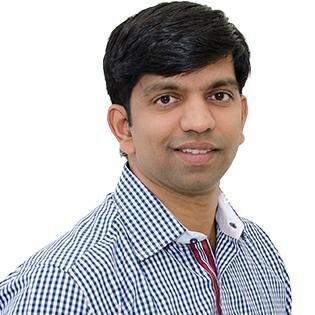 Over the last 4 years, Satish has helped several companies & startups with Big Data & Analytics solutions using Big Data technologies, advanced machine-learning algorithms and statistical models. His core competency lies in Big Data, applied math and statistical analysis, machine learning, artificial intelligence and data visualisation. Satish is passionate about applying maths, technology, design thinking and cognitive science to better understand, predict and improve business functions. Satish loves reading and learning new things in math, technology, design and decision science.